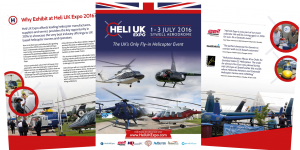 Heli UK Expo is the UK’s only fly-in helicopter exhibition, taking place 1-3 July 2016 at Sywell Aerodrome. It provides an event platform within a traditional airfield setting, where exhibitors and visitors can meet, connect and do business in a flexible and relaxed environment. Based at Sywell Aerodrome (EGBK), the event will represent all sectors of the Helicopter industry. Exhibitor Bookings for this much anticipated Summer 2016 event are already under way. Become part of the UK’s only Fly- in Helicopter event alongside other leading Helicopter brands and providers of products and services.